Coyote has a penchant for cash and he and his pal Snake are awaiting their big pay off in the dry heat of the hot Arizona desert. Click here to play! Help Coyote hold up the armored car to hit a big payday. Now is your chance to pull off the heist of the century with the help of Coyote. Five of his symbols not only pay off 10000 times your original line bet, but he doubles all other winning combinations when he substitutes for one or more symbols. If you're lucky enough to spin two or more Eagles you'll win up to 5000 times your original wager. Remember that Coyote doubles that to 10000! Coyote's compadre Snake is in on the action too, and if you get two or more Snakes in a winning line, you'll get 2500 times your wager. Of course there are other symbols such as the armored truck, cactus and skulls that will help you increase your share of the heist. To add to the excitement, the Loot scatter icons will multiply your total bet by as much as 200. Grab a mask and a six-shooter because it's your chance to join Coyote and his bandits on a job that will pay off big time! The Loot icon acts as the scatter icon. Two or more of these sacks of cash and your winnings will be multiplied respectively. Coyote is a mischievious little guy wearing a bandit mask and carrying a gun. He replaces any symbol to create a winning combination with exception of the scatter symbols. 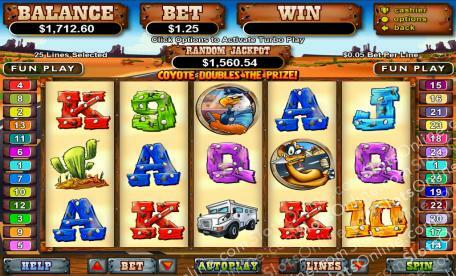 The prize is doubled when Coyote appears in the winning combination. Also, two or more of this icon pays out 10000 times your original wager.